It’s official. 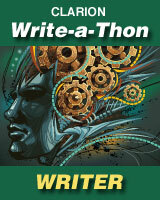 As per my secret plan all along, I have signed up for the 2011 Clarion Write-a-thon. It’s difficult to express the full impact the Clarion Writers’ Workshop has had on my writing, both as career and as practice. It really was a transformative experience, on a par with anything else I’ve ever done. So, given the opportunity to give something back, I suspect it’s not surprising that I’m not only willing but eager to do so. So here’s the deal. Over the six weeks that the 2011 Clarion Writers’ Workshop takes place, I (along with several dozen other alumni, former instructors and well-wishers) will be slaving away in solidarity on various projects, and trying to raise some money for the program, too. Donations can be made on a per word basis, a per week basis, or even a simple one-time lump sum. No donation is too small. Even one dollar makes some difference. Even better, Amazon has pledged to match donations for the Write-a-thon, so every dollar you can spare will go twice as far to support the program, which is indeed a training and proving ground for writers of speculative fiction, and whose list of distinguished alumni is longer than George R.R. Martin’s beard. So what will I be writing? The short answer is I’m going to write a novella or short novel called The Victorius Revolution (an offshoot, for those who know and/or care, of GoATDaD and the Army of Monkeys), which I expect to run somewhere between 35 and 50 thousand words. Sergeant Lee Victorius was never supposed to survive his sentence. But after five years behind enemy lines, he’s returned to his native Seattle, a bastion of civilization amidst the scarcity and want of the Permanent Emergency. But even Seattle has its dark side. South of downtown lies the Gray Area, a disincorporated reservation for the city’s undesirables, and the Cash District, where any desire can be fulfilled, so long as the price is right. Presided over by a ruthless crime boss known only as Mr. Jones, the Gray Area is a playground for Seattle’s citizens and tourists, and a prison for those consigned to live there. All Lee Victorius ever wanted was a quiet life in a quiet place. But when he finds himself exiled to the Gray Area, to scuffle and starve with the rest of society’s losers while the city glitters just out of reach to the north, he decides to take matters into his own hands. The Gray Area will never be the same. So here’s the deal, because good deeds deserve to be rewarded. If you make a donation of just $5.00, you’ll get a free e-pub copy of The Victorius Revolution when I publish it (by the end of the summer, if all goes according to plan). Donate $10.00 and not only will you get a free e-pub, you’ll be invited to read the draft as I write it. For $20.00 I’ll write you into the story as a minor character. Donate $50.00 or more, and I’ll write a 2000-word story about you being awesome.